The Gen Proof study groups are organized to study the new book Mastering Genealogical Proof, by Thomas W. Jones. 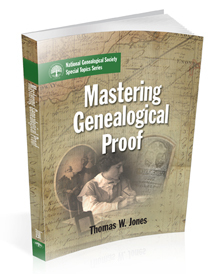 This is an exceptional textbook detailing the application of the Genealogical Proof Standard (GPS). The exercises will help you develop the skills you need to be comfortable applying the GPS to your genealogy work. This study program will consist of small groups of nine members and a mentor who will guide the discussions and answer questions. As you read the book highlight the key points and jot questions in the margins so you are prepared for your discussions. Video chat – These groups will meet weekly or bi-weekly at a designated time for a one hour video chat on a private Google Hangout. You MUST have a computer or a tablet with a headset and microphone to participate. This is great for those who like to meet in real time and video chat to discuss the subject. Text chat – These groups will meet weekly or bi-weekly at a designated time for one hour in a private chat room. You type your thoughts and questions via text chat and others will respond and discuss the concepts in real time. This format is good for those who do not want to video chat, but like a designated time each week to meet and discuss the subject. I noticed during a video chat (I was only able to view) that everyone seemed to be wearing the same headset. What type and where can I purchase a headset?